I love stories like this. 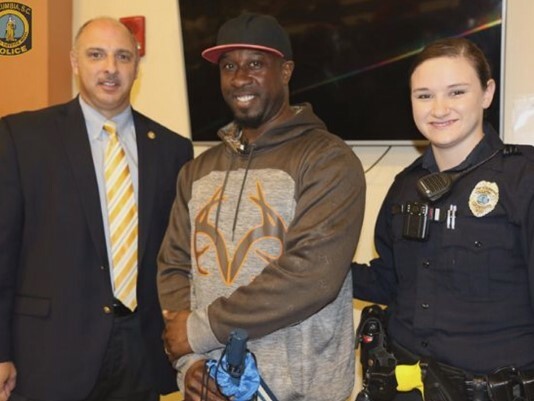 A homeless man in Columbia, SC is being lauded for coming to the rescue of a female police officer who was wrestling with a suspect during an altercation this week outside a Columbia gas station. Cray Turmon did not hesitate to jump into the fight. That’s bravery. Someone was taking video and it was all caught on it. The officer had been knocked down after tasing the suspect and using pepper spray on him. The scumbag’s name is Donald Songster Brown. Trumon tackled Brown and that allowed the officer to handcuff the idiot. Hardesty used her taser and mace on a man accused of punching a store clerk and pulling out a knife. The man wouldn’t back down. Turmon says it’s something he’s seen before and he is tired of the violence. When realizing the next step could be fatal, he stepped in, allowing Hardesty to handcuff the suspect. “I wouldn’t normally do something like that, but my instinct said just go. She’s a woman slammed to the ground and she’s an officer. I saw her belongings hit the ground. She’d done everything she could. It was going to get ugly, you know? Something had to be done,” Turmon told the media. What a great guy… homeless or not. He added, “Someone’s got to stand up. Someone told me if you don’t stand up for something, you’ll fall for anything. So I stood for something yesterday.” Somebody needs to hire this guy, stat. Turmon is working to get his life together after losing his license, job and home due to DUI arrests. This is a guy who has had everything go wrong for him and still has a great attitude. He’s turned his life around and strikes me as a moral man. He may have had a drinking problem, but it looks like he’s the kind of person who can overcome that. The Columbia Police Department honored Turmon Wednesday with a certificate for his “extraordinary actions to preserve life and aid public safety.” “It just felt good to actually have the law pat me on my back,” Turmon said. I’m impressed. This guy didn’t think of his own safety. He rushed in to protect a female police officer. That took guts. Doing the right thing usually does. Turmon probably just found a new best friend in Officer Ashley Haresty. Brown has been charged with attempted murder, armed robbery, kidnapping, possession of a weapon during the commission of a violent crime and resisting arrest. That guy is going away for a very long time. Good.